5 | 430 students enrolled. 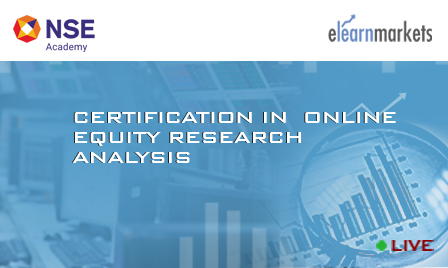 Certification in Online Equity Research Analysis course is jointly certified by NSE Academy & Elearnmarkets (NSE Academy is a subsidiary of National Stock Exchange of India). This course would cover basic investment topics as well as advanced fundamental concepts in a manner which is easy to understand for someone without a background in accounting. It includes discussions via case studies, understanding broader investment topics, outlines on how to analyse a company, evaluation of companies, comprehend the annual report, capital allocation decision, portfolio construction and rebalancing and creating a correct psychological framework that will help one traverse various cycles of markets. The objective of the Equity Research course would be to help you be a better investor to provide you with an understanding of how to identify, analyse the financial statements of a business and invest in companies with better investment decisions. This course also helps you become a equity research analyst by providing complete understanding of capital market & Industry Analysis. Students will be taught both qualitative and quantitative aspect of company analysis with live examples. Equity Research Analysts observe trends in specific industries, supervise research on companies of the respective sectors and decides what to buy, sell or hold in the portfolios. The course will provide end to end knowledge on how to value a company from scratch. Students enrolling for Certification in Online Equity Research Analysis program will be given a “Certificate of Completion” from NSE Academy, facilitated by Kredent Academy. The participants will also be given free access to all webinars conducted by Kredent Academy for further knowledge enhancement. The students can post all their queries in the discussion forum while pursuing the Equity Research course. Equity Research analysis course is skillfully designed for anyone who wants to improve his/her understanding of the capital markets, who are aspiring for success in capital markets, those who want to become Equity Research Analyst. This course will equally benefit those who are ambitious in becoming successful long term investors and take a non speculative path to create wealth, professionals who would want to learn how to invest, construct & manage individual portfolios and become self sufficient in managing their own money. Individuals at all levels who would want to learn fundamental analysis and analysis beyond valuations are welcomed for the Equity Research course. Internship- Practical internship of 6 hours available for the students at an additional fee of INR 5,000 + 18% GST. Under this course “Certification in Online Equity Research Analysis”, the participant will be required to appear for the internal examination and NCFM examination. Please note that the participant will get the Certificate of Completion of Certification in Online Equity Research Analysis after successfully clearing both the examinations. NSE Academy certification in Financial Market (NCFM) Examination: This examination is hosted by NSE for which you need to go to the NSE approved test centre. The participants have to appear for the NCFM Fundamental Analysis, preferably within 45 days after the completion of the module/ course. Once the student enrolls in the Certification in Online Equity Research Analysis, he/she has to do NCFM registration. This is necessary in order to get the login credentials, so as to book the test date and the test centre to give the examination. Click here to register. The exam fees for the NCFM Fundamental Analysis Module are Rs 2,006 (two thousands six only) inclusive of service tax.